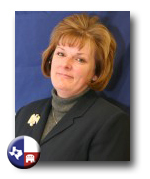 Stephanie Klick was elected Chairman of the Tarrant County Republican Party September 17, 2005, after having served as Vice Chair for over 5 years. She is a graduate of Texas Christian University with a Bachelor of Science in Nursing. She first became involved in the Republican Party while a student at TCU as a member of the Tarrant County Young Republicans. During her tenure as Vice Chair, she was the Primary Administrator for the 2002 Republican Primary. During the 2002 General Election, she developed a successful ballot security program which was later adopted in other areas of the state. She has served as Precinct Chair, Area Leader, Senate Convention Chair, State Convention Caucus Chair, and member of the Rules Committee of the Republican State Convention. She is the mother of 4, grandmother of 3, and has been married to her husband Don for 30 years.